Pumpkin Lasagna & Rosemary “Ricotta’! Blend “ricotta” ingredients together in a Vitamix or food processor, slowly pouring the oil while blending. Blend until smooth like a ricotta texture. Scrape mixture out with a spoon into a bowl. Refrigerate while making the sauce. Turn oven on to 350 F. Bring a large pot of water to boil (large enough that the lasagna noodles will fit in without bending). Heat oil in a medium saucepan over medium-high heat. Add onion and sauté for 2 minutes. Add carrot and sauté an additional 2 minutes. Add garlic, pumpkin pie spice, rosemary, basil, and parsley. Add Pumpkin puree, water, almond milk, salt and pepper. Bring to a simmer for 10 minutes. While simmering, cook lasagna noodles for 5-10 minutes (According to box directions). 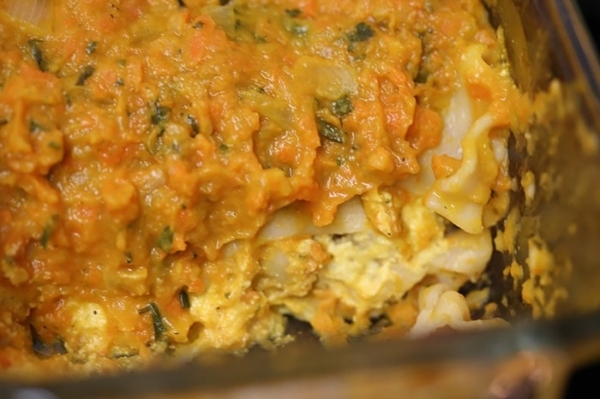 When done, line a 8” x 4” baking dish with ¼ cup of sauce on the bottom, 2 layers of noodles, ¼ cup sauce, ¼ cup ricotta, 2 noodles, ¼ cup sauce, the rest of ricotta, 2 more noodles on top, cover with sauce and bake, uncovered, for 20 minutes or until hot. Pumpkin Lasagna & Rosemary “Ricotta” Bon Appétit!